A countdown that will change your life. 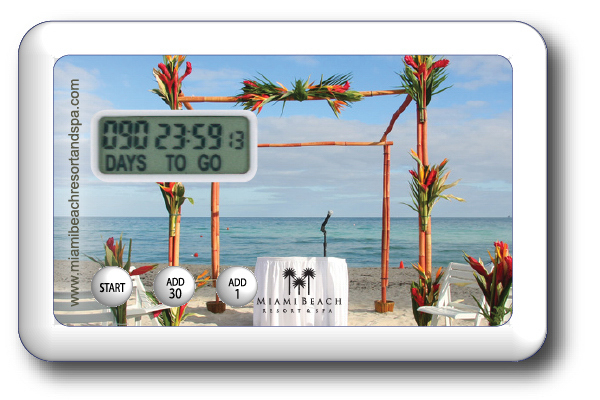 Help brides build excitement to the big day with an Original Timeflyz Wedding Day Countdown Timer. This credit card sized refrigerator magnet features a built in desk stand, custom 4 color printing and 1.5v button cell battery for long lasting promotional appeal. Timer easily adjusts to any day up to 999 days out. This fun promotional product is the perfect ‘thank you’ to any business in bridal services: gift registry boutiques and retailers, dress designers, tuxedo rental, cake decorators, and wedding planners. This product is great because it countdowns to your special date.